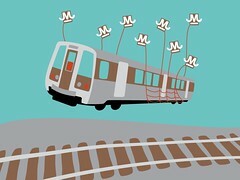 Thanks much to Unsuck DC Metro for posting the tale of yesterday’s broken train which screwed up rush hour, forcing single-tracking between Rosslyn and Foggy Bottom. If you’ve ever been on a stuck train, you’ll recognize the brusque behavior of the train operators, as well as the radio conversation with Central. If you want the official version of what happened to go along with the on-train story, The Post has Metro’s explanation.